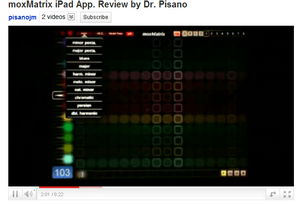 moxMatrix turns your iPad into a unique electronic musical instrument. It’s a new kind of sampling groovebox! Enjoy the vibrant intuitive interface and push your rhythmic and melodic musical ideas to the limit. It pulses under your touch and with your music. Create loops that include 10 distinct sampled voices and two drum tracks with 12 drum samples each. Use your own samples and create a truly unique beat. Simply drag them into the application when your iPad is connected to iTunes. Each track can be customized with a sample set, transposition, scale, and mix volume. Assign distinct scales to each track, from melodic minor to the whole tone scale to the blues scale. Store your loops in the pattern bank, capable of holding 32 separate patterns. Loops can be from one to sixteen measures long — that’s 256 beats! Use your own sounds or use any of the several dozen included. Engage JAM mode to improvise with all your tracks over a beat you’ve created. moxMatrix represents a convergence of beauty of design, ease of use, and the iPad’s revolutionary possibilities. It’s our hope that this instrument helps you explore new musical ideas and achieve creativity in unexpected ways. moxMatrix is a great application for creating and generating Grooves and Drum Beat Patterns. One of the highlights of this applicaiton is the ability to import your own samples for use with the application (Find out how to do this here: http://moxmatrix.com/samplehelp.php). The included sound sets are very good and you will get a lot of mileage out of them. If you are looking for a program like this, your search may be over. Recommended for your iPad music tool arsenal? Yes, if you use generators like these. Caveats: I would love to see some more documentation with this application. iPad Music App. Developers: Read are CALL for application submissions here!